Freight Train Rabbit Killer, the duo comprised of Kristopher Bruders and Mark Smeltzer, came together in Kansas City, Mo., but more recently the two have been taking out of state trips, touring, hitting the highway to spread their apocalyptic doom-blues sound. 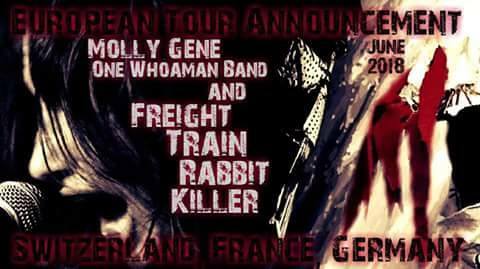 The end of May saw Freight Train Rabbit Killer expanding even further, as they’ve embarked on their first European tour, with Molly Gene One Whoaman Band, who’s been on several Europe tours and released a live disc of her performance at the 2016 Blues Rules festival in Switzerland. Bruders said they are indebted to her for taking Freight Train Rabbit Killer on a European tour. He expressed a sense of gratitude regarding Molly Gene and the tour. “I’ve always wanted to tour overseas,” Bruders said. One of the first Europeans gigs was at this year’s Blues Rules festival on June 2. 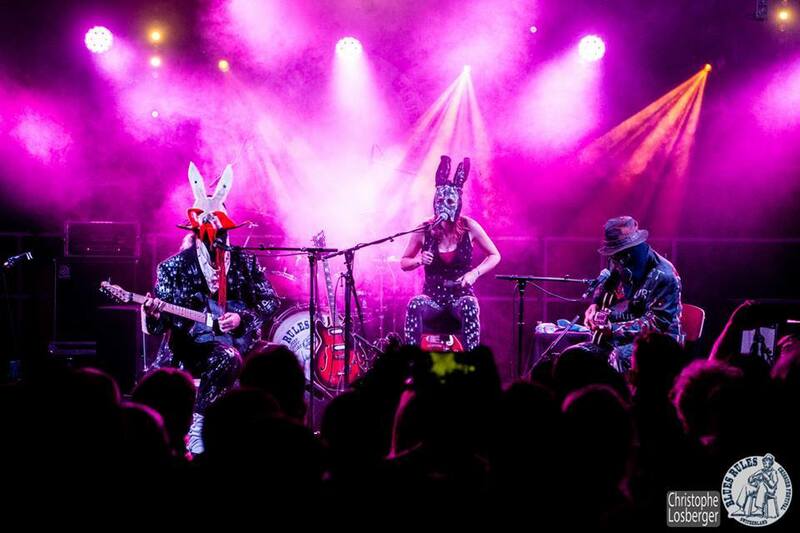 Before heading to Europe, Freight Train Rabbit Killer was being booked on notable festivals in the States. Muddy Roots Music Festival would end up being important, with the one door opening another effect. In attendance at Muddy Roots was a promoter from the MoonRunners Music Festival in Chicago, which took place May 4-5. Along with Freight Train Rabbit Killer, other acts on the MoonRunner’s bill included Darci Carlson, Molly Gene One Whoaman Band, Carrie Nation & The Speakeasy, among others. Freight Train Rabbit Killer hit the stage on a Friday at 3:15 p.m.
After playing, they didn’t have time to stick around and check out any other bands or performers —They had a six hour drive to Wisconsin wherethey recorded tracks for a yet to be released album, which Bruders estimates will be out next year. Bruders said the Chicago show was great, and the audience was responsive. As Bruders and Smeltzer cross state lines, some constants remain for Freight Train Rabbit Killer — they are rarely met with moderate indifference. Bruders said people either love or hate their music, regardless of what city or state the band is in. He elaborated, saying their music is intense “It’s going to affect you, move you,” Bruders declared. Death is a reoccurring theme within Freight Train Rabbit Killer’s lyrics. The music is downtuned, tormented and washed in waves of harsh distortion — it doesn’t sound like contemporary rock or pop. At times, their music is as unnerving as anything by Lydia Lunch or Diamanda Galas. It’s not for everyone, but Freight Train Rabbit Killer has a devoted following. To appease that following, their music was released in digital form across online streaming platforms over Memorial Day. The decision was made because fans of the band wanted the music in a digital form online. There was no artistic motivation in holding out on digital streaming until recently. “We don’t go with the flow,” Bruders said. Freight Train Rabbit Killer has their own way of doing things, which extends to how they release music. Such is the case with their “Wake Snake Death Dance” project, a series of limited edition 45 vinyl singles. The first record, “Wake” was released in the fall of 2017, the second, “Snake” was released on April 13 and the third, “Death” is scheduled for a July 20 release. Within the sleeves of each record are clues for a scavenger hunt, leading to a yet to be revealed prize. Smeltzer said Freight Train Rabbit Killer is about more than music, extending to various other ventures and creative expressions, ranging from their own brand of hot sauce to a comic book, written by Bruders and Smeltzer and illustrated by Patrick Quinn. Bruders was manning a booth at the 2016 Kansas City Comic Con at Bartle Hall. Freight Train Rabbit Killer played an after party at the convention and a release party for the comic book at recodBar in October that same year. Freight Train Rabbit Killer puts an emphasis on the stories within their songs as being central to the band’s identity. Smeltzer said for the first year of performing as Freight Train Rabbit Killer, he and Bruders wouldn’t verbally engage with the audience, because it wasn’t something their characters would have done. When Bruders and Smeltzer take to the stage with their faces cloaked in masks, it’s not just a look . The two are assuming the roles of self-created characters, two vigilantes, one fighting a spiritual battle and another fighting a battle in the physical realm. Smeltzer said as Freight Train Rabbit Killer continued to play out, the audiences they were playing for became less scared of them. “Now people are understanding,” Smeltzer said. Smeltzer said he and Bruders will keep rolling and expand their audience. For more, follow Freight Train Rabbit Killer on Facebook here.